CHRIS RAMSEY: From £24.15, 7.30pm Theatre Royal, Brighton 0844 871 7650. KRATER COMEDY CLUB: Until July 8, 7pm/8pm/10.30pm, £5-£36.50 Komedia, 44-47 Gardner Street, Brighton 0845 293 8480. LEWES RIVERSIDE CLUB: Modern Day Slavery by Katy Bourne, 2pm St Thomas’ Church Hall, Cliffe, Lewes. SEAFORD COMMUNITY CINEMA: Barn Theatre, Saxon Lane, 7.30pm. Film Stars Don’t Die in Liverpool, cert 15. Tickets £6/£5/£3.50. Available from Seaford Tourist Information Centre, 37 Church Street, 01323 897426. CRAWLEY FESTIVAL CONCERT: 12.30pm, Silver Birch Singers with John Scott Cree. Music at St John’s Church, off the High Street. Free. GIGNITE: The Shelley Arms, Broadbridge Heath, 8pm. NATE AUSTEN: The Kings Arms, Horsham, 8pm. NEFARIOUS PICAROONS (WITH SUPPORT FROM ELTEL): Cranleigh Arts Centre, Cranleigh, 7.30pm. SLURRED: Railway Inn, Billingshurst, 9pm. THE RIDE: Free, 8pm Lewes Con Club, 139 High Street, Lewes 01273 473076. Live funk and soul. BRITAIN THROUGH THE DECADES: £6, 7pm White Rock Theatre, Hastings (01424) 462288. Presented by St Paul’s. GAME ON: £18.50, 7pm (2pm July 7) The Hawth Theatre, Crawley (01293) 553636. BPM Dance Academy. GUYS AND DOLLS JR: £11-£44, 2.30pm/7.30pm The Royal Hippodrome, Eastbourne (01323) 802020. A feel good show for all the family presented by The Broadway Players. EDINBURGH PREVIEW: £8, 7.30pm Komedia, 44-47 Gardner Street, Brighton 0845 293 8480. Short & Curly and Norris & Parker. LEWES FOOTPATHS GROUP: Afternoon Tea Stroll with Graham and Hilda 472678. Meet on Cliffe Bridge, Lewes, 2.30pm. MID SUSSEX RAMBLERS: South Downs Circular, 5.5 miles with Ray 01403 783797. Meet at the car park on SDW about 2 miles SW of Storrington off B2139, 10am. FOLK AND IRISH MUSIC: Harvest Home Entertains for The Smiles Foundation. At Broadwater C of E Primary School. A ploughman’s supper will be served and a raffle will take place during the evening. Doors open 7.15pm for 7.30pm start. Tickets £7 in advance only from Annette on 07717 634734. MIDSUMMER MUSIC: With Classical Folk. Music by Saint-Saëns, Schubert and Brahms. Folk music and song from around the world. 7.30pm, £8, St John the Evangelist, Lower Church Road, Burgess Hill. Tickets from The Parish Office, Burgess Hill Town Help Point or on the door. MUSICIANS OF ALL SAINTS: £9-£12, 7.45pm All Saints Centre, Friars Walk, Lewes (01273) 486391. TUNES AND TEA: A Taste of America presented by the Sunday Morning Singers in pictures, words and song. Lindfield URC, 3pm. Free admission, refreshments. In aid of the continuing work of the Air Ambulance. KING OF POP: £20, 7.30pm Chequer Mead, East Grinstead (01342) 302000. Michael Jackson tribute starring Navi. HORSHAM ROCKS PRESENTS: Rhythmic (The Hat Man), The Carfax Bandstand, Horsham, 12.30pm-2.30pm. LEWES SATURDAY FOLK CLUB: £6, 8pm Elephant and Castle, Lewes. Unreel Quartet. Scottish and US songs, guitar and fiddle. LOVE ACTION: £7, 8pm Lewes Con Club, 139 High Street, Lewes 01273 473076. 80’s Night. STAR SHAPED: £5, 11pm Komedia, 44-47 Gardner Street, Brighton 0845 293 8480. Party Night. THE ILLEGAL EAGLES: From £19.90, 7.45pm Theatre Royal, Brighton 0844 871 7650. GIOVANNI PERNICE: £24-£50, 7.30pm Pavilion Theatre, Marine Parade, Worthing 01903 206206. Born to Win. SHOWSTOPPERS: £17.50, 7.30pm White Rock Theatre, Hastings (01424) 462288. Tomboogie and Tbad. STRAIGHT UP ‘18: £12-£15, 6pm Brighton Dome (01273) 709709. Streetfunk with Pro-Motion Dance Crew. EDINBURGH PREVIEW: £8, 7.30pm Komedia, 44-47 Gardner Street, Brighton 0845 293 8480. Anna Morris and Eleanor Conway. ARGOS HILL WINDMILL: Mayfield, just off A267 between Mayfield and Mark Cross, 2pm-5pm. Admission is free but donations welcome, car parking will be sign posted. Bus Services 251/252 pass nearby with a walk up closed road to the Mill, National Cycle Route No. 21 adjacent, light refreshments. 01435 873367. Also Tuesdays 10am-2pm. Brian Pike Friends of Argos Hill Windmill. EXHIBITION: Patina Moving On Parade Exhibition at Linklater Pavilion, Railway Land, Lewes noon-4pm. Free entry. HORSHAM AND CRAWLEY CYCLE TOURING CLUB: 40-mile loop ride to south of Horsham including pub lunch stop. Meet at Horsham Pavilions in the Park, 9am. All welcome. Visit www.meetup.com/Horsham-Crawley-CTC. MID SUSSEX RAMBLERS: Heathland Walk, 2 miles with William 01444 831098. Meet at Land End Common car park, 2pm. OPEN GARDEN: Halford Manor, North Chailey, 11am-4pm. Stunning flowers and borders, shep and gees plus Forestry School and Mobile Making from Plumpton College £5pp. Entry £5, free parking. CHARLIE AUSTEN: Railway Inn, Billingshurst, 1pm-3pm. FUNDAY SUNDAY: Horsham Park, 12pm-6pm. THE GREATEST HITS OF MOTOWN: From £23.90, 7.30pm Theatre Royal, Brighton 0844 871 7650. How Sweet It Is. ROBERT WATTS: 1.45pm Assembly Hall, Stoke Abbott Road, Worthing 01903 206206. An afternoon with Star Wars Producer Robert Watts. STRAIGHT UP ‘18: £12-£15, 2pm Brighton Dome (01273) 709709. Streetfunk with Skebe Kings Dance Crew. EDINBURGH PREVIEW: £8, 7.30pm Komedia, 44-47 Gardner Street, Brighton 0845 293 8480. Jake Lambert and Seann Walsh. SUSSEX FAMILY HISTORY GROUP: Subject and speaker TBA, 7.30pm Bridge Cottage, High Street, Uckfield. THE ARTS SOCIETY STEYNING: Next meeting, Leslie Primo will give an illustrated talk on Foreigners in London: 1520-1677. Leslie is a graduate with a degree in Art History and an MA in Renaissance Studies from Birbeck University College, London. He has specialised in early Medieval and Renaissance studies, including Italian Renaissance Drawing, Art and Architecture in Europe, Medici and Patronage, Narrative Paintings in the Age of Giotto and the work Peter Rubens. He currently lectures at The National Gallery, the National Portrait Gallery, and teaches courses at Imperial College, Covent Garden and Bishopsgate Institute London. Coffee from 10am. Talk 10.30am-12pm, The Steyning Centre, Fletchers Croft, Church Street, Steyning. BURT BACHARACH: £50-£72.50, 7.30pm Brighton Dome (01273) 709709. Live in concert. KICKS DANCE: £13-£15, 7pm and July 10, The Hawth Theatre, Crawley (01293) 553636. Ten Year Celebration. THIS IS ELVIS: From £15.90, 7.45pm until July 14 (Thurs/Sat mat 2.30pm) Theatre Royal, Brighton 0844 871 7650. A new musical. TROY STORY: £6-£8, 7pm Chequer Mead, East Grinstead (01342) 302000. Crawley Down Primary School. EDINBURGH PREVIEW: £8, 7.30pm Komedia, 44-47 Gardner Street, Brighton 0845 293 8480. Sara Barron and Laura Lexx. LEWES FOOTPATHS GROUP: Barcombe Mill, 6 miles with Ian 812546. Meet at North Street car park, Lewes, 9.30am. MID SUSSEX RAMBLERS: Farmland and Forest, 11 miles with Judith 07899 992261. Meet at MSDC car park in Horsted Keynes, 10am. ELIO PACE PRESENTS ELVIS PRESLEY: 7.30pm, £24.50, The Capitol, Horsham, 01403 750220. OH SEES: £25, 7pm Brighton Dome (01273) 709709. Plus support. 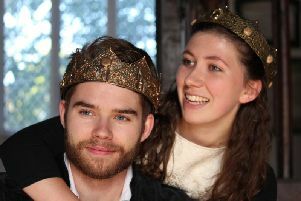 RAINBOW SHAKESPEARE: £17, 7.30pm until July 15 (Sat/Sun mat 2pm) Highdown Gardens, Worthing 01903 206206. The Two Gentlemen of Verona. THE ARTS SOCIETY: £22.50, 6.30pm Chequer Mead, East Grinstead (01342) 302000. East Grinstead Arts Society 50th Anniversary Celebratory Lecture. EDINBURGH PREVIEW: £8, 7.30pm Komedia, 44-47 Gardner Street, Brighton 0845 293 8480. Great British Mysteries and Maisie Adam. MID SUSSEX RAMBLERS: Around Cuckfield, 3 miles with John 01444 483860. Meet at Broad Street, Cuckfield car park, 7pm. Spiritual healing: 7pm-8pm, £5, Barnham Community Hall, Yapton and Barnham SNU Spiritualist Pioneer Centre. SUSSEX FAMILY HISTORY GROUP: Hearth and Home: Aspects of Sussex Housing History by Geoffrey Mead, 7.30pm the Ventnor Hall, Blatchington Road Hove. WALK: Park and meet 10am, Henfield Cricket Ground off the A281 (BN5 9RP). 6-mile HDC walk, mostly flat (some stiles) through fields to near Albourne green, expansive views of the South Downs, back through Woodmancote Place Deer Park. No dogs. 2½ hours. Mike 07855 502023. DAVID HARRILD: 7.15pm, £7.50, Roffey Club, Spooners Road, Horsham, www.horshammelodytimes.co.uk, 07940 360189. WIND IN THE WILLOWS: £7, 2pm Chequer Mead, East Grinstead (01342) 302000. The Meads Primary School. EDINBURGH PREVIEW: £8, 7.30pm Komedia, 44-47 Gardner Street, Brighton 0845 293 8480. Laura Patterson and Joe Sutherland. MID SUSSEX RAMBLERS: Sussex Diamond Way Stage 7, 9.3 miles with Paul J 01444 441530. Meet at the car park on Chillies Lane just north of primary school, High Hurstwood, 10am. OPERA DOUBLE BILL: Mozart’s Bastien and Bastienne and Bach’s Coffee Cantata. Sung in German with dialogues in English, 7.30pm-9.15pm, St Mary’s Church, 61 St James’s Street, Kemptown, Brighton. This is event is the UK conducting debut of Afro-Peruvian conductor Dante Valdez. Tickets £15. Special deal online, four for £40. Concessions £12. Visit www.stephenelleryconductor.co.uk. A COUNTRY NIGHT IN NASHVILLE: £27, 7.30pm The Hawth Theatre, Crawley (01293) 553636. Starring Dominic Halpin and The Hurricanes. DIAL M FOR MURDER: £16-£23.50, 7.45pm until July 21 (Wed/Sat mat 2.30pm) Devonshire Park Theatre, Eastbourne (01323) 412000. DREAMBOYS: £21-£29, 8pm White Rock Theatre, Hastings (01424) 462288. Suitable for 18yrs plus. MADAMA BUTTERFLY: £20-£260, 5.10pm Glyndebourne (01273) 815000 boxoffice@glyndebourne.com. Duke Of York’s (0871 902 5728): Whitney (15) Fri 12.45, 6.00; Sat 6.00; Sun 3.15; Mon 3.00, 5.45; Tue 3.45, 8.30; Wed 3.45, 6.30; Thu 1.00, 3.45; Big Scream: Wed 10.30. Leave No Trace (PG) Fri & Sat 9.00; Tue 10.30; Wed 1.15, 9.15; Thu 10.30, 9.15. McQueen (15) Fri 3.30; Mon 12.30. Kids’ Club: Wonderstruck (PG) Sat 10.30. Toddler Time: Sarah And Duck: Animal Visits (U) Mon 11.00. The Beatles Yellow Submarine (U) Sun 11.00, 6.00. A Quiet Place (15) Sun 1.15; Tue 6.30. Vintage Sundays: North By Northwest (PG) Sun 8.30. Postcards From The 48% + Q&A (PG) Mon 8.30. Discover Tuesdays: Racer And The Jailbird (15) Tue 1.00. Time Trial (18) Thu 6.30. New Park (01243 786650): The Bookshop (PG) Fri & Sat 1.15, 6.00; Sun 1.00, 6.15; Mon 12.30, 5.45; Tue 12.30, 5.15; Wed 1.15, 8.30; Thu 3.45, 8.30. The Boy Downstairs (12A) Fri 3.45; Sun 8.45; Mon 8.15. The Ciambra (15) Fri 8.30; Sun 3.30; Wed 6.00; Thu 1.00. All The Wild Horses (15) Sat 3.45; Tue 3.00; Thu 6.15. McQueen (15) Sat 8.45; Wed 3.45. Paths Of The Soul (12A) Mon 3.00. An American In Paris (PG) Tue 7.45. Arts Centre (01483 278000): The Shape Of Water (15) Thu 8.00. Curzon (01323 731441): Sicario 2: Soldado (15) 2.05 (not Wed); 5.05, 8.05. The Bookshop (PG) 2.00, 5.00; 8.00 (not Wed). The Happy Prince (15) 2.10; 5.10 (not Wed). Jurassic World: Fallen Kingdom (12A) 8.10. On Chesil Beach (15) Wed 2.05, 5.10, 8.00. Scott Cinemas – The Atrium Cinema (01342 321666): Adrift (12A) 3.00, 5.35. Ocean’s 8 (12A) Fri-Wed 8.15. Patrick (PG) Fri & Mon-Thu 3.15, 5.35; Sat & Sun 1.00, 3.15, 5.35. Jurassic World: Fallen Kingdom (12A) 2.00, 8.00. Sicario 2: Soldado (15) 5.10, 7.50. Kids Crew: Duck Duck Goose (PG) Sat 10.10. Kids Crew: Isle Of Dogs (PG) Sat 10.10. Kids Crew: Peter Rabbit (PG) Sat 10.10. Show Dogs (PG) Sat & Sun 12.45. Skyscraper (12A) Thu 8.15. Pavilion (01323 841414): A Quiet Place (15) Fri, Sat & Sun 7.45. Sherlock Gnomes (U) Sat & Sun 2.15. I Got Life! (Aurore) (15) Mon & Tue 7.45. Lean On Pete (15) Wed & Thu 2.15, 7.45. The Capitol (01403 750220): Swimming With Men (12A) 1.45, 4.45, 7.45. Zoo (PG) 2.15, 5.15, 8.15 (not Sun); Sun 5.15. Family Film Fun: Boss Baby (U) Sat 10.30. Metropolitan Opera Summer Encore: Eugene Onegin (Tchaikovsky) (tbc) Sun 2.00. Ryuichi Sakamoto: Coda (tbc) Mon 8.00. Muse: Drones World Tour (tbc) Thu 7.00. Depot (01273 525354) (lewesdepot.org): Ocean’s 8 (12A) Fri, Mon & Tue 6.00, 8.30; Sat & Sun 3.30, 6.00, 8.30; Wed 1.00, 3.30, 6.00, 8.30; Thu 5.45, 8.30; Parent & Baby Screening: Tue 12.00. Whitney (15) Fri, Sat, Tue & Wed 6.15, 8.45; Mon 5.45, 8.15; Thu 6.00, 8.15. Hereditary (15) Fri-Sun, Tue & Wed 6.15, 8.45; Mon 5.45, 8.15; Thu 6.00, 8.15. Postcards From The 48% (PG) Fri & Wed 3.30; Sat 5.30; Sun 6.00, Mon & Thu 3.15; Tue 5.45. The Bookshop (PG) Fri, Mon & Tue 3.30; Sat, Sun & Wed 3.45; Thu 3.15. Leave No Trace (PG) Fri & Tue 3.45; Sat 3.00; Sun & Wed 8.30; Mon 2.00; Tue 3.45; Thu 3.30. The Deer Hunter (18) Mon 7.00. My Genderation (15) Thu 7.30. Muse: Drones World Tour (15) Thu 8.15. Believe That (U) Sun 12.00. Up (U) Sat 11.00; Sun 12.30; Relaxed: Sun 12.45. Windmill Cinema (01903 715920): The Happy Prince (15) Sun 3.45; Mon & Tue 6.10. Tully (15) Sun 6.10; Tue 8.20. Funny Cow (15) Mon 8.20. Seaford Community Cinema, Barn Theatre (www.seafordcinema.org): Filmstars Don’t Die In Liverpool (12A) Fri 7.30. The Picture House (01825 764909): McQueen (15) Tue & Wed 8.15. Swimming With Men (12A) Fri & Thu 2.10, 6.10; Sat 4.10, 6.20; Sun 4.10, 8.35; Mon & Tue 2.00, 8.35; Wed 2.20, 6.20; Parent & Baby Screening: Thu 11.15. Adrift (12A) Fri 6.15; Sat 11.15, 4.25, 6.30; Sun 2.00, 4.05; Mon 6.35; Tue 2.10, 6.35; Wed 8.35; Thu 6.20; Parent & Baby Screening: Thu 11.30. Sicario 2: Soldado (15) Fri 2.00, 8.30; Sat 6.00, 8.30; Sun 8.30; Mon & Tue 4.05, 8.20; Wed 2.10, 8.20; Thu 2.20, 6.00. The Bookshop (PG) Fri & Sun 6.10; Sat 2.00; Mon 2.10, 5.30; Tue & Wed 5.45; Thu 2.00, 8.25. Ocean’s 8 (12A) Fri & Thu 8.35; Sat 1.45, 8.35; Sun 1.15, 6.10; Mon-Wed 6.00. Jurassic World: Fallen Kingdom (12A) Fri 2.20, 8.25; Sat 11.30, 2.30, 8.25; Sun 11.10, 1.30, 3.30, 8.25; Mon & Tue 2.20. The Little Vampire (U) Sun 11.20. Saturday Morning Movie: The Little Vampire (U) Sat 10.30. Yellow Submarine: 50th Anniversary (U) Sun 11.00, 6.30. Oscar Wilde Season Encore: An Ideal Husband (PG) Wed 2.00. Muse: Drones World Tour (PG) Thu 8.15. Dome (01903 823112): 2001: Patrick (PG) Fri, Tue & Thu 5.45; Sat & Sun 10.15, 12.00, 5.45; Mon 12.15, 5.15; Wed 12.00, 5.45. Jurassic World: Fallen Kingdom (12A) Fri 2.50, 5.40, 8.00; Sat & Sun 12.15, 2.20, 5.40, 7.45; Mon 12.00, 5.15, 7.30; Tue 2.50, 5.40, 7.45; Wed 12.15, 4.40, 8.00; Thu 5.30. Parent & Baby Screening: Swimming With Men (12A) Mon 12.00. Coco (PG) Sat & Sun 10.25. Sherlock Gnomes (U) Sat & Sun 10.00. Sicario 2: Soldado (15) Fri 3.00, 5.00; Sat, Sun & Tue 3.00, 8.00; Mon 2.30, 5.00; Wed 3.00, 5.15; Thu 3.00, 8.00. Skyscraper (12A) Thu 3.00, 8.25. Swimming With Men (12A) Fri 2.45, 7.45; Sat & Sun 12.40, 5.25; Mon 2.15, 2.45, 7.45; Tue 3.00, 5.20; Wed 12.45, 2.20, 8.00; Thu 3.00, 5.20. The First Purge (15) Fri & Tue 8.30; Sat & Sun 3.05, 8.30; Mon 8.15; Wed 3.00, 8.30; Thu 7.45. Connaught (01903 206206): Tag (15) Fri 12.45; Sat & Thu 8.15; Sun 1.15, 5.40; Mon & Tue 8.30; Wed 3.00. Mary Shelley (12A) Fri & Wed 3.00; Sat 12.45; Sun 3.30, 5.40; Mon 2.45; Tue 3.00, 8.30; Thu 3.15, 8.15. The Bookshop (PG) Fri 3.30; Sat 1.00, 5.45; Sun 1.00; Mon 8.15; Tue 3.30; Wed 12.00; Thu 12.30, 6.00. Adrift (12A) Fri 5.45; Sat 8.15; Sun 3.30; Mon 6.15; Tue 6.00; Wed 8.15; Thu 3.30. The First Purge (15) Fri, Mon & Thu 5.45; Sat, Sun & Wed 6.15; Tue 8.15. Leave No Trace (PG) Fri 6.00; Sat 3.20; Sun 8.15; Mon 12.15; Tue 1.00, 8.15; Wed 5.45; Thu 12.45, 5.45. Grease 2 (PG) Fri 8.15; Sat 12.45. Sicario 2: Soldado (15) Fri, Sat, Sun, Wed & Thu 8.30; Mon 3.30, 8.30; Tue 5.45. Saturday Morning Pictures: Mary And The Witch’s Flower (U) Sat 10.15. Silver Screen: The Bookshop (PG) Mon 11.00.